NEW YORK (JTA) — May women enter the Orthodox rabbinate? May conversions to Judaism be left to the discretion of a local or communal rabbi, or must they be sanctioned by a centralized rabbinic authority? How do concerns for peoplehood weigh on the issue of who is a Jew? Do Jewish tradition and liberal democracy intersect in positive ways or are they mutually irreconcilable? Disagreements over these and other questions have divided the world of contemporary Orthodoxy. Orthodoxy itself is divided among its haredi, centrist and modern wings. As Orthodoxy continues to grow in importance in terms of demographics and politics, it increasingly will fall under the scrutiny of friend and foe alike. Several weeks back a group of Orthodox thought leaders, rabbis, communal professionals and lay leaders announced the formation of PORAT – People for Orthodox Renaissance and Torah. The new organization is a vehicle to reclaim the mantle of modern Orthodoxy and provide a distinctive counter voice to those advocating greater isolationism and rejection of modern currents. Its founders include, among others, Victoria Lindenbaum Feder, Michael Fishbane, Rabbi Irving “Yitz” Greenberg, Rabbi Yehuda Sarna, Rabbi Dan Smokler, Sivya Twersky and Rabbi Avi Weiss, as well as myself. PORAT is designed as a grassroots movement and support group for those committed to tolerance and an inclusive community. It brings together lay and religious leaders to advocate for thoughtful observance of halachah, or Jewish law, and progressive education. It is meant not to supplant existing organizations so much as to facilitate safe space fostering open dialogue while advocating Torah values. Additionally, it aspires to demonstrate the existence of a real constituency that is dissatisfied with the Orthodox establishment and desires real change in Orthodoxy’s self-understanding and culture. First, the voices of modern Orthodoxy, often silenced in recent years by an ascendant haredi community, have much to contribute. They insist that secular culture is both part of God’s creation and a vehicle to better understand Jewish text and tradition. They support gender equality within the parameters of halachah and cooperation with all Jewish religious movements for the collective enhancement of the Jewish people. They are committed to religious Zionism as an unprecedented opportunity to demonstrate the meaning of a Jewish state and its compatibility with the principles of liberal democracy. These elements represent the cardinal principles of a distinctively modern Orthodoxy from which there can be no retreat. Although each has been under attack from the Orthodox right, for a variety of reasons, PORAT believes firmly in their centrality to the Jewish people and its future. Second, given the Orthodox drift to the right over the past five decades, PORAT’s founders believe it is necessary to restore an ethos of open dialogue, inclusivity and receptivity to diverse views. As the monopoly of the Chief Rabbinate in Israel over personal status matters has demonstrated, imposing one view over the entire Jewish people only ignites a backlash against Jewish tradition, and alienates many from Israel as a Jewish state and from Judaic heritage more generally. PORAT aspires to foster an atmosphere of open discussion and exchange, mutual respect and inclusivity. PORAT neither expects nor desires unanimity or agreement with its positions on the highly contentious and controversial issues delineated above. What it does expect is respect for those who disagree in principle rather than confrontation. Third, PORAT is necessary today precisely because rather than becoming moribund, modern Orthodoxy appears to be on the cusp of resurgence. Gender equality, new rabbinical training programs, receptivity to modern scholarship in the study of the Bible and Talmud, renewed interest in interfaith dialogue — all have appeared on the Orthodox scene in novel ways in recent years. PORAT aims to work with the nascent institutions and voices promoting these values in the hope of creating a vibrant, exciting and inspired modern Orthodoxy. The entire Jewish community has a great stake in PORAT’s success. At present, Orthodox and non-Orthodox Jews coexist virtually on parallel planes, as demonstrated by two recent Pew studies of American Jewry and Israeli society. Demographic data alone point to Orthodoxy’s demographic and political ascendancy in Jewish communal affairs as well as Israeli society. As Orthodoxy and non-Orthodoxy increasingly drift apart, bridges need to be built between all sectors of the Jewish world. Historically, modern Orthodoxy served as that bridge. Modern Orthodoxy forfeited its verve and independence in recent decades; bridges were torn asunder. Non-Orthodox communities ignored Orthodox teachings, which have much to offer, on the grounds that “they do not recognize my Judaism in any case.” The Jewish world is much the poorer for the weakness of modern Orthodoxy. A grassroots support group like PORAT may rebuild those bridges and strengthen Jewish unity, peoplehood, and intra-Jewish relations. Porat’s inaugural conference will take place on May 15, at Congregation Kehillat Jeshurun in New York City. Much depends on the outcomes of PORAT’s efforts, and the stakes for all of us are much too high for it to fail. Steven Bayme is the American Jewish Committee’s director of contemporary Jewish life and a founding member of PORAT. 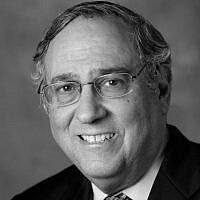 Steven Bayme is the American Jewish Committee's director of contemporary Jewish life and a founding member of PORAT.